Playing a hunch, local Rochester Falconcam members “Shaky”, Carrie, Carol and Kathy made an impromptu trip to Pickering, Ontario over the weekend to look for Quest. Her transmitter data have been very consistent over the past several weeks and they were hoping to find her. 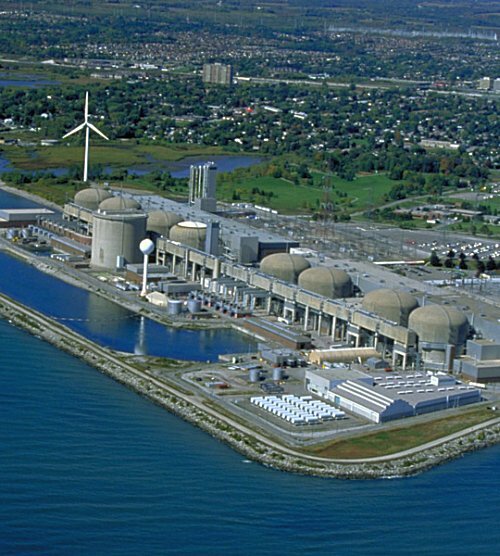 The team’s good fortune was rewarded on Saturday when they located her at the Pickering Nuclear Generation Plant on the shore of Lake Ontario! 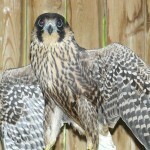 Because of the high security around the facility (pictured above) and it’s shear size, the watchers weren’t able to get close enough to see her antenna, but positional data from her satellite transmitter placed her at the plant at the same time as the sightings, so all the available data point to this falcon being Quest. Not only that, but it looks like Quest may have found herself a mate! 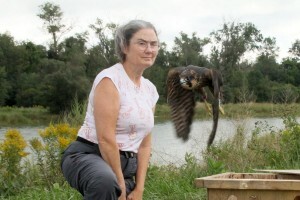 The watchers reported that she was flying with a smaller falcon, making “ee-chupping” sounds typical of mated pairs, playing “talon tag” in the sky, and generally acting friendly toward each other. 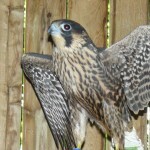 Unfortunately they weren’t able to get a picture of Quest, but Carol Phillips posted some pictures that show the male falcon. He appears to have a very white breast. You can see Carol’s picture album by clicking here. It remains to be seen whether Quest and her tiercel will make the Pickering Power station their home, or choose another location. 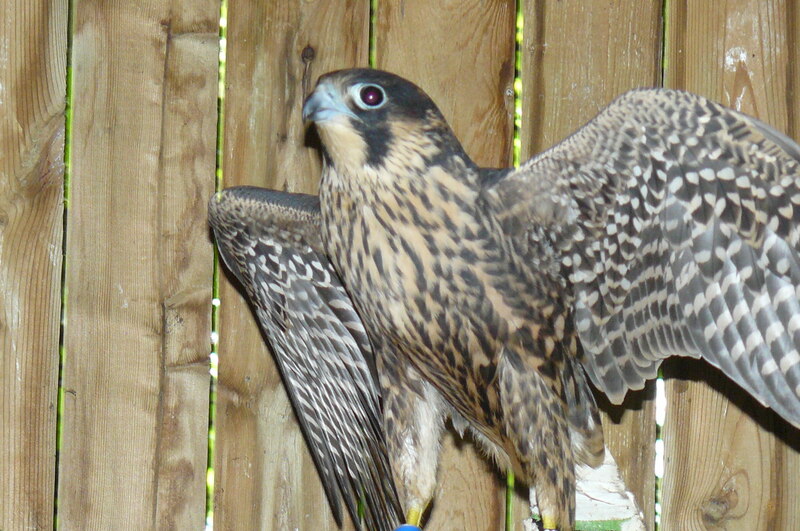 We’re in the process of contacting the Canadian Peregrine Foundation for assistance. Obviously a nuclear power plant is a sensitive location, so we’re hoping that if Quest does decide to settle down there, the CPF can work with the Ontario Ministry of Natural Resources (MNR) and Ontario Power Generation to erect a nest box on the site. It’s probably too early to make those kind of plans right now, but it’s good to know that Quest is beginning to build a family. We don’t recommend going to the plant to see her, but if you decide to try for a look, be aware that security is extremely tight at this sensitive location. Our watchers were questioned multiple times over the weekend by security personnel from various agencies. In these times of heightened terrorism awareness it’s might be best to steer clear of the power plant. Quest’s transmitter data show that she’s been visiting the area around nearby Tam O’Shanter Park quite frequently. That would seem to be a better place to try to view her in our opinion. True to form, Quest has remained in Toronto’s eastern suburbs for most of August. 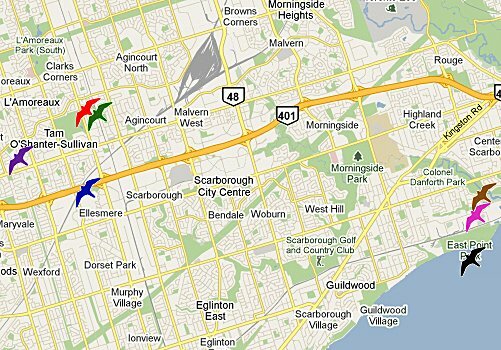 She’s opened up her travels a little though, wandering back toward Pickering, Eglinton East and Murphy Village, to name a few of her stop-overs. Satellite images of the area show a lot of green space and high buildings, so she’s certainly feeling right at home, or at least comfortable enough to want to stay a while. Updated with video clips – see below! 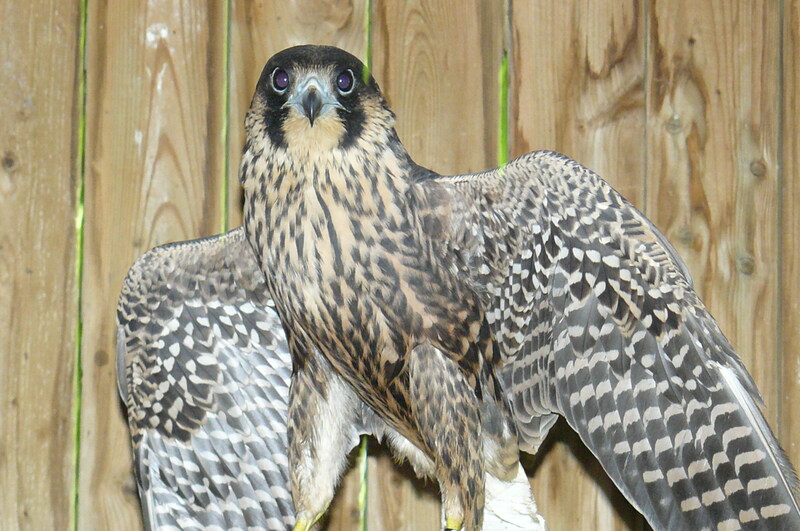 After six weeks of rehabilitation, we received word late last week that Jemison was hunting & killing her own food and flying competently in a 180-foot (55 meter) flight cage. Since she was doing so well, the rehabber and DEC biologists determined that she was ready for release. So at lunchtime today, members of the Genesee Valley Audubon Society and the Rochester Falconcam met the DEC’s Mike Allen at the Montezuma National Wildlife Refuge, about 45 miles (72 km) east of Rochester. Alert readers may recall that Montezuma was the site of Mariah’s release following her stint in rehab last year. After picking up refuge Manager Bill Stewart, the group took a short trip along Montezuma’s wildlife drive and found a convenient spot away from highway traffic. Mike and Bill placed Jemison’s wooden carrier on the gravel and the Audubon Society’s June Summers released the lid. Jemison took off right away, flying close by Falconcam member Jim Pisello before climbing high over the wetland. As Carol noted, this was the best outcome we could hope for. Everyone at the release agreed that Jemison was flying well, with no trace of an injury. She gained altitude before soaring away to the north and west. Will she return to Rochester, or strike out for some new destination? We can only wonder where her travels will take her. Wherever it is, we know the good wishes of her many fans will go with her. 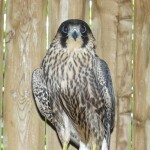 It truly is a group effort to make sure that these young peregrines have the best opportunity to lead successful lives. The Rochester Falconcam is grateful for the dedication of Mike Allen, Jenny Landry, Barb Loucks and everyone at the DEC & the rehab staff who took care of Jemison and returned her to flight status. Special thanks also to Dr. Balonek and all the folks at the East Ridge Animal Hospital; Dr. Parsons, Gary and the staff at the Black Creek Wildlife Center as well as the Rochester Animal Control; and Bill Stewart and everyone at the Montezuma Wildlife Refuge. And of course, we want to acknowledge the many volunteers who keep an eye on Jemison and all the Rochester falcons year after year. Your efforts are all appreciated! Scarborough, Ontario has been Quest’s home for all of August. It looks like she’s settled into a routine, moving between Tam O’Shanter Park and East Point Park on the Lake Ontario shore. Timestamps from her transmitter show that she’s spending the nights inland, near the Tam O’Shanter golf course. The lakeside locations all have daytime timestamps, so it’s likely she’s spending her days harassing the shorebirds. With this kind of consistency, it’s possible that an enterprising local birder could stake out these parks and get a look at her. Any takers out there? If you see Quest, we’d love to hear about it. And we’d really love to see a picture of her! 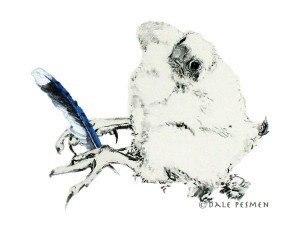 The latest t-shirt design available in the Rochester Falconcam Zazzle store comes to us courtesy of Dale Pesmen. Besides being a long-time fan of the Rochester falcons, Dale is quite the artist. 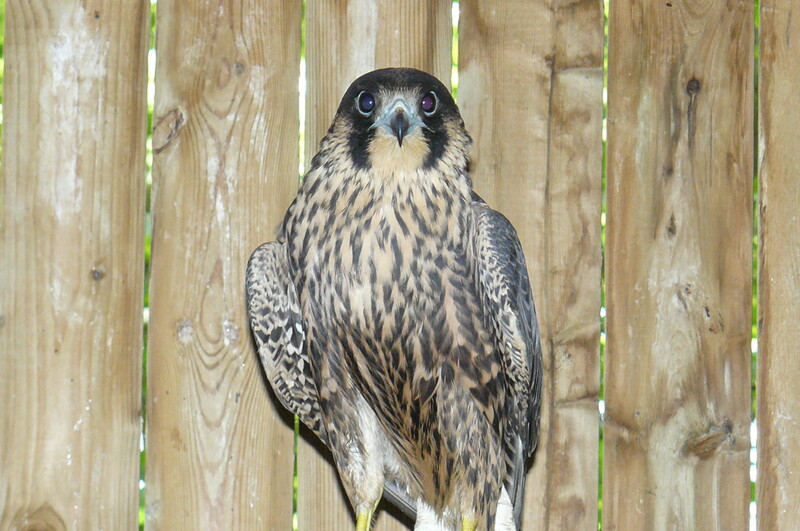 Her image of a peregrine eyas playing with a feather is a real keeper, perfect for any falcon lover! At the Rochester Falconcam Zazzle store you can order the eyas on a white or black t-shirt, with a choice of red, yellow or blue feather. You’ll be helping to maintain the Rochester Falconcam with your purchase, and you can show off the work of a very talented artist at the same time. So head on over to Zazzle or one of our other stores for all of your Rochester Falconcam merchandise needs! As we reported previously reported, Jemison’s recovery has been going very well. She’s been moved to a larger flight cage so that she can exercise her wings in preparation for an eventual release. The rehab specialist taking care of Jemison says that she continues to be feisty and she takes lots of baths in the water bowl provided for her! We don’t yet know when Jemison will be ready to be released, but we do know that she won’t be released back here in Rochester. The biologists at the DEC have determined that Jemison’s safety could be jeopardized if she’s released in Rochester because so much time has passed since she was injured and taken away. It’s likely that by now Archer and Beauty wouldn’t recognize Jemison if she were returned here. If the adults were to treat her as an intruder she could be re-injured or at least forced out of the territory under unfriendly circumstances. We know everyone was hoping for a different outcome, but releasing Jemison away from Rochester will give her the best chance for safely making it through these next few months, which are crucial to her development into a full-fledged adult. We’re in close contact with the rehabber and the DEC so we’ll make sure to get more information as it becomes available. After spending much of July in the neighborhood of Brampton, Ontario, Quest decided to end the month by going eastward. She passed by Toronto on her way to Pickering. We’re pleased to see that in her third year, Quest and her transmitter are still going strong, though we’re wondering when (and where!) she might settle down to start a family of her own. You are currently browsing the Imprints blog archives for August, 2010.